0 Comment July 12, 2017 Like? PTZOptics is proud to announce four new NDI compatible camera models with built-in NDI, NewTek’s industry leading IP technology. The new 12x and 20x NDI camera models will support Power, Control audio and video all over a single Ethernet cable simplifying installation and setup for live streaming systems. NDI is a paradigm shift that will increase what is possible in all things live video. In this video, we will think outside the box about how to plan out live streaming and video production systems in the world of IP. Using standard networking infrastructure NDI will enable us to do more with less. We will uncover new possibilities for low budget streaming and high end video productions system alike as we move toward the future of broadcast video over IP. Let’s capture some low hanging fruit with the benefits of broadcast IP video and eliminate the need for capture cards in our next live streaming system design. Imagine an entire generation of video engineers who will never use expensive SDI cabling and capture devices. Using NDI we will have access to sources from anywhere on our network. We will no longer be restricted to sources directly connected to a single system. Capture cards are used for low latency video conversion from traditional HDMI or SDI video to USB or PCIe where we can use them with production software such as vMix, Wirecast, LiveStream and more. What if we could eliminate the need for capture cards altogether by providing the same quality, low latency video directly to Wirecast, vMix, Live Stream, OBS, or xSplit over the Ethernet connection we are already using. In one fell swoop we have eliminated a point of failure from our video production workflow and reduced the cost of implementing a new system dramatically. At the end of the day we have opened up a whole new universe of possibilities where the network you already have has become the preferred method of video routing. Need another camera shot? Just run a single Cat-5 cable to the PTZOptics NDI camera and you will have high quality video, camera control and power solved in an instant. As you can see, we can start to envision new IP workflows leveraging free and professional IP video tools available from NewTek and 100’s of other NDI developers. Do you work with a creative team? They will love the free Adobe Creative Cloud plugin for NDI. Atre you working on a budget? Tryout the free Open Broadcaster Software plugin for NDI or start out with low cost vMix HD license. The move toward IP video production will make the answer to your next live streaming challenge “Sure, we can do that”. Adding another camera to your system will be easier than ever using a single ethernet cable for audio, video, PTZ camera control and power to simplify your life. Accomplishing your goals with IP based video will become a solution you won’t want to live without. 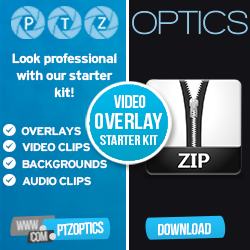 At PTZOptics, we are here to help with training resources and a dedicated support team. With NDI, NewTek has already done the heavy lifting and paved a future proof solution for a world of high quality IP video. Live Streaming Rookies and Broadcast professionals alike will find ways to use NDI compatible software and hardware to change the way we think about live streaming and video production. So whether you are a school looking to broadcast a morning announcements show or a small business adding live video into your marketing strategy with a PTZ camera system. Even team of broadcast professionals will find IP video will likely help you accomplish your goals. That’s why we are offering a new NDI video production course for free with the following coupon code: IPVIDEO available on UDEMY. We believe that this technology has the power to save organizations thousands of dollars with live video projects small and large and that is why we have joined 100s of other manufacturers in the industry standardizing around the NewTek NDI protocol. A basic understanding of what is possible with IP Video and NewTek’s NDI will go a long way to paving a future proof solution for your live video production. Whether you are a one man production studio searching for ways to do more with less, or an advanced team of Broadcast experts, we believe the future of IP video will enhance your capabilities greatly.